Investments in a refinery are much lower than for an integrated sugar plant. These plants also run through the year, unlike an integrated plant which operates at peak capacity during sugarcane season. Imports can ensure adequate availability of raw sugar too. But there are a few risks: the government can restrict raw sugar imports or place export obligations and, of course, the availability and price of raw sugar can fluctuate. SRSL’s Brazilian acquisition will secure its raw material supplies. The price: it will be paying $82mn or about ₹ 380 crore as consideration and will also take on $158mn or about ₹ 735 crore of debt. After a 3-year moratorium, the debt has to be repaid in 5 years. Vale brings a 3.1mn tonne annual sugar-crushing capacity, and sugar and ethanol plants. The acquisition also comes with stakes in logistics facilities useful for storage and exports. No financial details have been disclosed about Vale’s revenues or profitability. The company was reported to be a distressed asset and the company has disclosed that the deal has been approved by the company’s creditors. SRSL recently raised about ₹ 506 crore through a QIP issue for its expansion plans. It had a post-issue debt to equity ratio of nearly 1:1. The acquisition will strain SRSL’s debt profile further. If Vale is incurring losses then this will reflect in its consolidated financials. The profits earned from refining raw sugar and the benefit of secured raw material supplies need to be adequate, to compensate. During a boom period, such as the current one, higher sugar realisations will lead to high profit growth. The acquisition’s logic may appear quite sound during this period. But when the cycle turns, as it will, things may be different. The company’s stock price has risen by about 12% over the past month and by about 2% after the acquisition was announced. It quotes at about 11 times its fiscal 2011 (year ended September 2010) earnings. 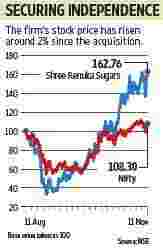 The boom in sugar is driving investors towards sugar stocks. But investors may want to see the combined effect of the acquisition in SRSL’s consolidated figures, to get a better picture.